Arezzo is a city in central Italy, capital of the province of the same name, located in Tuscany. 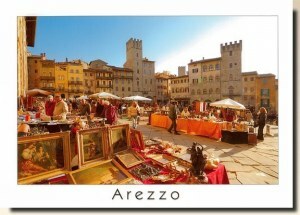 Arezzo is about 80 km (50 mi) south-east of Florence. Described by Livy as one of the Capitae Etruriae (Etruscan capitals), Arezzo is believed to have been one of the twelve most important Etruscan cities. Etruscan remains establish that the acropolis of San Cornelio, a small hill next to that of San Donatus, was occupied and fortified in the Etruscan period. There is other significant Etruscan evidence: parts of walls, an Etruscan necropolis on Poggio del Sole (still named "Hill of the Sun"), and most famously, the two bronzes, the "Chimera of Arezzo" (5th century BC) and the "Minerva" (4th century BC) which were discovered in the 16th century and taken to Florence. Increasing trade connections with Greece also brought some elite goods to the Etruscan nobles of Arezzo: the krater painted by Euphronios ca 510 BC with a battle against Amazons (in the Museo Civico, Arezzo 1465) is unsurpassed.